The Mo and I had some shopping to do in Chestnut Hill yesterday. No, we are not rich nor are we pretentious. We had gift cards from our wedding/bridal shower to Crate and Barrel and Bloomingdale's that we figured we put to use and the closest Bloomingdale's was located in the affluent area. I've heard Shake Shack is a pretty big deal and the wait is pretty can be tedious. We arrived after 3 PM and thought no one really eats at 3, it's a weird time to eat and there shouldn't be a line. After all, it's not lunch or dinner. Boy was I wrong! We arrived and the line was already out the door! Thankfully for us, it was 55 degrees outside and the weather was beautiful. Once we were inside, there was still another mini maze that we had to get through before we could order. The large posted menu was convenient so we could decide what we wanted to to order before getting to the register. I think I changed my mind like 5 times! There was beer and wine by the glass (or bottle) for consumption. 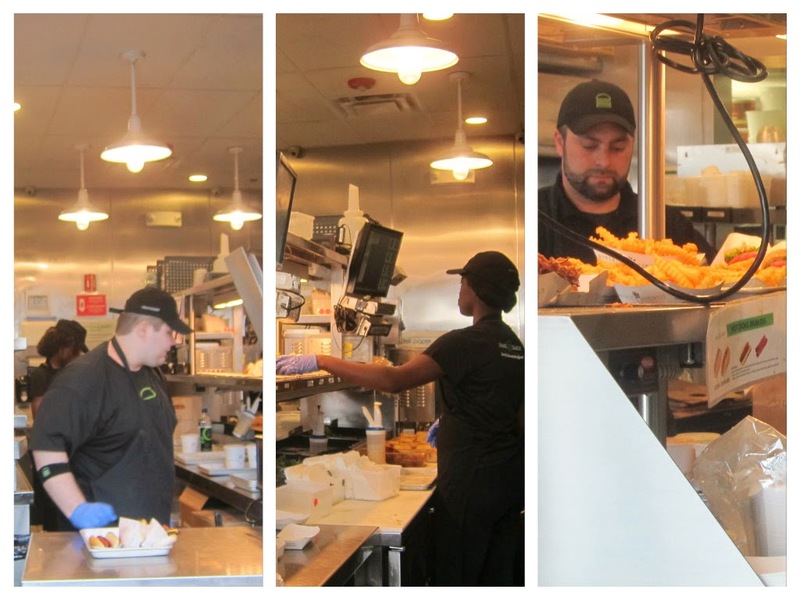 While standing in line, the employees were on display in the open kitchen. There were different stations for shakes and frozen custards, fries and burger assembly. The employees looked less than enthusiastic to be working. I thought it was cool that they had doggy treats. I would have got one for Chewie and Odie but I thought the custard would have melted by the time we got back home. The custard flavors changes everyday. The flavors for March was posted throughout the restaurant. I didn't care much for Saturday's flavors which were Golden Sponge and Creme Cake. 20 minutes had elapsed between the time we arrived and the time we ordered. We paid at the register and received a pager to notify us once our food was ready. The Mo grabbed us a table in the cramped dining area because we did not want to sit outside. It was a nice day and all but there was a cool breeze. I admired the industrial decor in the restaurant with the exposed ceiling and wooden walls. The track lights added a nice architectural element to the space. After waiting another 12 minutes, our pager went off and our food was ready for pickup. I stopped at the convenient condiment station for ketchup, napkins and cutlery which reminded me that this was just a step up from a fast food establishment. If you know me, you would know that I absolutely love hot dogs! One time, I went on a hot dog scavenger hunt. I went to 7-11 on my lunch hour and they ran out. I went to Carli's convenience store (gas station) and they ran out. I went to Shaw's (the hot food section) and they didn't have any that day. I was bummed. That night, I stopped at Market Basket on the way home and we had hot dogs for dinner that night. 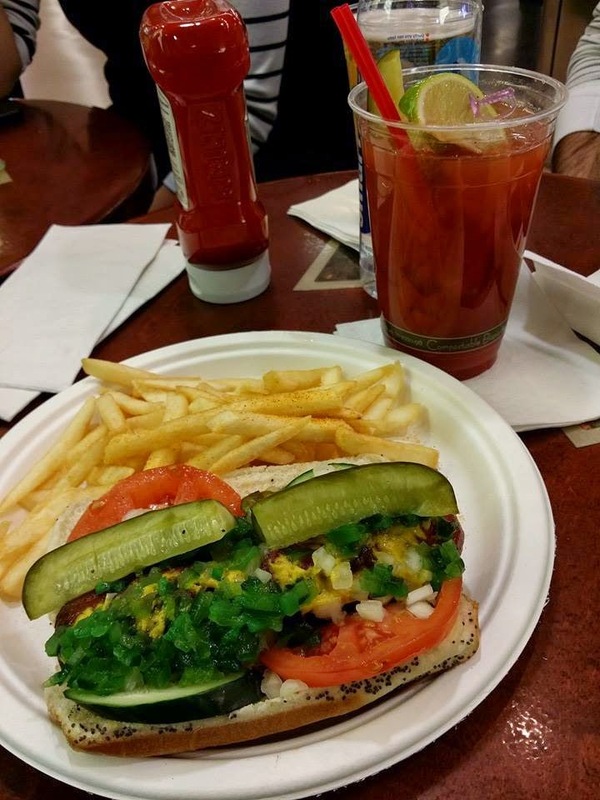 The last time I was at an airport, I had a Chicago Dog at 9 in the morning. Picture below. Shake Shack's DogMeister is probably one of the best hot dogs I've ever had! I already love hot dogs and I love fake hot melted cheese! The crispy ale marinated shallots were perfect! I already buy Martin's potato burger, hot dogs and sliced bread and thought it was even better that they were serving my one of my favorite food on my preferred bread choice. There's only one other person that I know that buys Martin's potato hot dogs rolls and his name is Samir. He's a cool kid. The SmokeShack cheeseburger was topped with applewood smoked bacon, chopped cherry pepper and ShackSauce. We got the double version with 2 beef patties. The burger was tasty but there was too much going on inside of the buns. I wished the buns were bigger to accommodate everything in between. Also, I didn't notice any "special" sauce. We added ketchup to make up for it. We split a side of crinkle cut cheese fries. They were hot and crunchy, fresh out of the fryer. 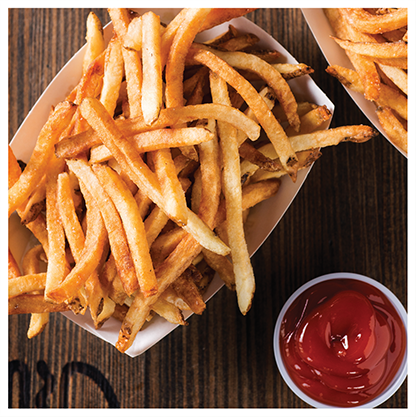 The website shows different fries but we weren't given an option. The place is known for their custard and shakes so we had to give it a try. I ordered the Fair Shake which is a coffee shake using vanilla custard and made with 100% certified organic Arabica Fair Trade beans. Pricing was a bit steep at $ 5.00 for a small cup. By the time we were done with our meal, the line had grew even longer since it was getting closer to dinner time. 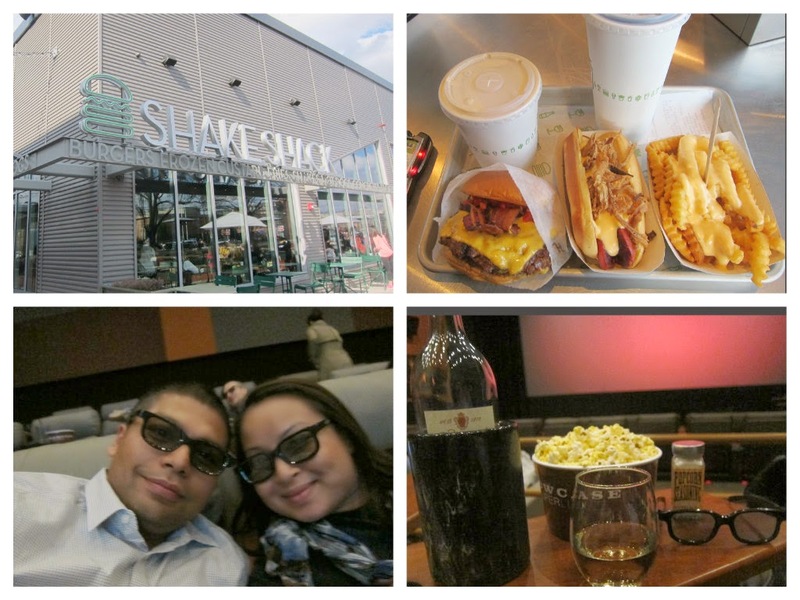 Despite the wait, I really did like the food and experience at Shake Shack. We would probably return if there was a location closer to us but I don't think we would drive 30 minutes just to eat there. We had a Showcase gift certificate that we won a Christmas Yankee swap and thought it would be a good idea to put it to use since there was a Showcase SuperLux conveniently located in the same vicinity. We walked into the grand entrance and headed over to the self ticketing kiosks. I was blown away by the prices. $20.00 for LuxLite and $ 28.00 for SuperLux tickets each. Since we rarely go to the movies, we opted for the premium SuperLux which comes with unlimited popcorn, prime seating and an "on call" waiter service. Both ticket options comes with a $5.00 food and beverage credit and plush, fully recline leather seats. There is a small bar area in the grand lobby for those who wants to grab a drink before or after the movie. We arrived our theater 20 minutes for the movie showtime and given a quick run down on the "experience." The seats were indeed very plush and comfortable. I put my feet up and unzipped my boots for extra comfort. (No, I didn't' take them off) The seats are good for couples or sitting with people you know. There was a double next to us with two men that didn't know each other so I imagine it must be weird to share an arm rest with a complete stranger. The iPad menu featured Davio's famous spring rolls and higher end foods like fried calamari, beef carpaccio and tuna sashimi. We ordered a bottle of white wine to share at $34.00 each and the Mo got Thai crispy chicken bites. I was happy with the unlimited popcorn and my new Cheddar flavor seasoning from Crate and Barrel. They brought around our 3D glasses and were were ready to start the movies: 300 The Rise of an Empire. Yup, I took a selfie. What would have been $100.00 for movies and drinks ended up costing $70.00 after the coupons and gift certificate. The movie was a great experience. I never want to watch a movie any other way but let's be realistic, we couldn't afford to watch movies all the time. The Mo and I were joking, if this was a first date, it would be a pricey one. Our food bill wasn't too bad, it came to a little over $30.00 after our $10.00 food and beverage credit. Hey, just gotta try it once right?